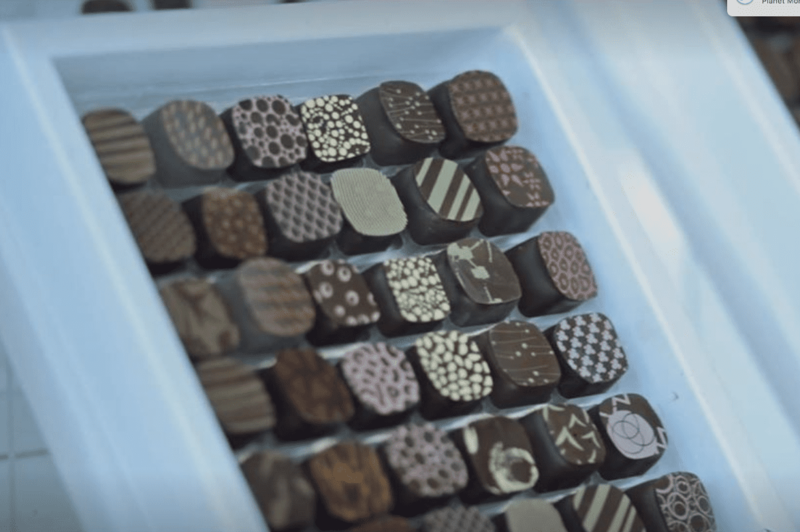 Richart is a chocolate company in Lyon, France with a long tradition. The perfect sampler might be one of the Rendez-Vous collections. They were created as a tribute to the original Maison Richart, founded in 1925 by Joseph Richart. Of course, there are less exotic choices, including hearts filled with salted butter caramel, dark chocolate ganache, or praline. Or, you can choose dark chocolate bars or the petit Richart bars, which are not bars at all. For those who don’t care for chocolate, there are pates de fruits and macarons, as well. There’s a reason Jacques Torres is called Mr. Chocolate, and you’ll see why when browsing his website. There’s much more than just boxed chocolates and bars, although those are plentiful, too. Chocolate chip cookies are sure to please, but if you prefer to bake your own, there is a chocolate chip cookie baking mix, so you can serve them warm from the oven. Chocolate baking discs are ideal for all of your own chocolate recipes, and the hot chocolate mix is ready and waiting for a mug. For something truly unique, there are chocolate potato chips, a heart puzzle made from chocolate, and chocolate coated pretzels. And that’s just the tip of the chocolate iceberg. For the undecided or for the perfect chocolate-indulgent gift, there are gift boxes with a selection of different products. There’s probably one that’s perfect for anyone on your list. Who wouldn’t love a box full of mice? Let's rephrase that: Who wouldn’t love a box full of adorable chocolate mice? You’ll find them, and penguins, too, at L.A. Burdick. In business since 1987, the mice have become a signature item, and their cuteness makes that no surprise. The founder, Larry Burdick, had a vision to “combine Swiss know-how, French gastronomic thoughtfulness, and American imagination,” and it seems he’s worked that out. For those who prefer classic over whimsical, there are bonbons, caramels, and chocolate cigars. The everyday assortments and signature assortments offer a variety of flavors and include at least one of the chocolate mice, depending on the assortment size. Oh, but that’s not all. Drinking chocolate—the high-end cousin of everyday hot chocolate—is sure to bring a smile to anyone’s face on a cool evening or just about any day when you need a little comfort. If you need proof that chocolate isn’t just for kids, the Distillers Collection from Moonstruck Chocolate Co. will convince you. These can only be sold to people 21 or older, and a signature is required upon delivery. The nine-piece set features chocolate infused with distilled spirits from craft distilleries in Oregon. If that spirit doesn’t move you, there’s also a brewers collection that’s less potent but just as intriguing. Moonstruck isn’t all about the liquor, though. You’ll find caramels, toffee, bars, and truffles in a wide variety of flavors from espresso to orange. There are also whimsical shapes like black cats, ladybugs, and lambs as well as classic shapes and designs. If that’s not enough, there are a variety of hot chocolate mixes as well to tickle your palate and warm your heart. While the selections at Christopher Norman Chocolates aren’t quite as broad, it’s hard to say no to a chocolate Oxford spotted pig that has little chocolate piggies inside. It’s a whimsical, wonderful, and unique gift that won’t be easily forgotten. A more classic gift is the box of nine chocolates, all ready to be wrapped, but if the chocolate is just for you, you might want to choose one of the bar assortments. What's unique about these bars is that you can choose your flavors. Go with all of them in one flavor or pick up to five flavors, depending on the size of the assortment. Ganache is the signature item from MarieBelle, and the ganache collections are almost too pretty to eat. But, hey, it’s chocolate, so you will eat them, one lovely piece at a time. While ganache-filled chocolates are featured prominently, there are other tasty treats as well. Clusters are French croquette cookies rolled in chocolate that look rustic and crunchy. River rocks and olive candies are pretty and quirky, too. And then there are bars, sold singly or in boxed collections. If that’s not quite what you’re looking for, there are also truffles, caramels, and hot chocolate mixes to explore. If you can’t find something you like at this Vermont chocolate company’s site, perhaps you haven’t browsed enough. Seasonal and holiday collections will keep you coming back to see what’s new at Lake Champlain Chocolates, while boxes of truffles could easily become favorites. Assortments include gift boxes, baskets, and samplers, or you could order a chocolate of the month collection for a gift that lasts. Their blue bandana chocolate bars are made from beans sourced directly from the farmers, while the five-star bars are filled with nuts, caramel, fruit, or granola. And that’s just the beginning bars of this chocolate serenade. You’ll also find hot chocolate, baking chocolate, and cocoa. The individually-wrapped small chocolates are sold in bulk and these would be the perfect party favor for any occasion. You might know the Vosges name from the chocolate bars that are sold in stores. However, you need to take a peek at their beautiful, elegant truffles in the truffle collections. You can choose exotic, dark, milk, or Italian truffles, in boxes of several sizes. There are even collections that include a bottle of wine—for adults only, of course. While the truffles are featured, the gift collections include much, much more. You’ll ogle salted caramels, dream of peanut butter bonbons, and do a happy dance over the chocolate covered marshmallows. And of course, there are the bars, sold singly or in collections. If you know exactly which bars you love best, the mix ‘n’ match chocolate bar collection lets you choose the flavors of the six bars you’ll receive. 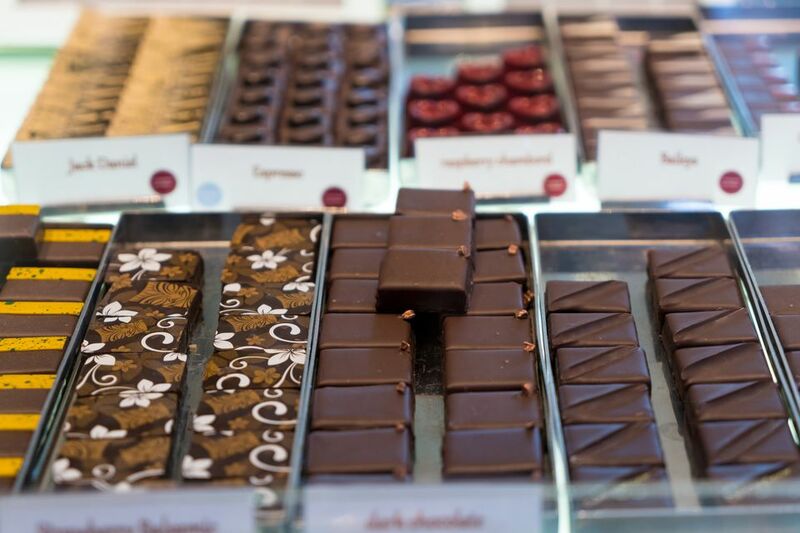 Recchiuti Confections has it all, from boxed chocolates to chocolate sauces. It also ventures a bit beyond into marshmallows, brownies, and s’mores kits, as well as pate de fruits. Gift boxes aren’t limited to boxed chocolate either, they can include sauces and bars as well. But that doesn’t mean you can’t buy a box of chocolates—there is a wide variety, with themes ranging from classic to contemporary and from burnt caramel to whisky pairing. The caramels are there, too, for those who love that classic combination. In the just plain fun category are malted milk balls, peppermint thins, and peanut butter pearls. The hot chocolate is particularly interesting since it’s not the typical powdery substance. Instead, these are small round chocolate discs that melt into the hot milk to create a smooth, rich chocolate drink. If that’s not enough chocolate in your life, there are recipes for using some of the chocolates in baked goods, hot drinks, and even a chocolate martini.